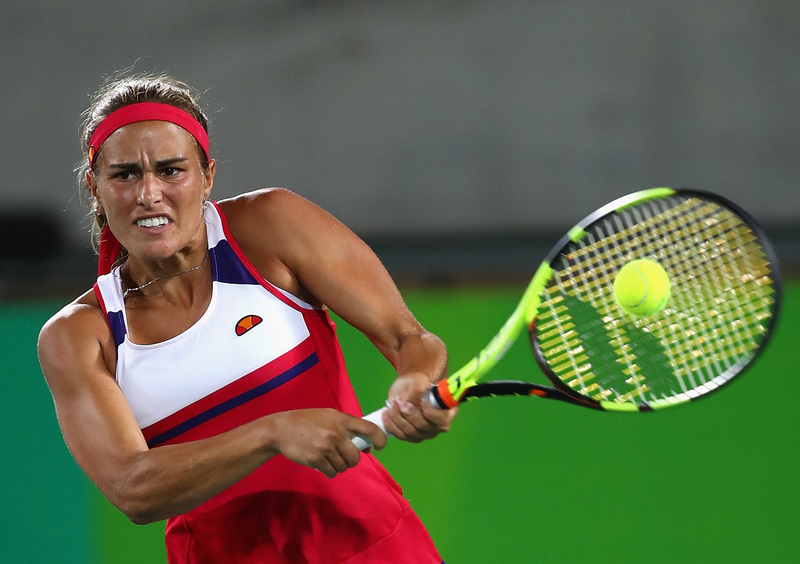 Monica Puig Makes Olympic History, Winning Puerto Rico's First Gold Medal : The Torch Puerto Rico has been sending athletes to the Olympics since 1948, a stretch in which it amassed eight Olympic medals, none of them gold. Tennis star Monica Puig changed that on Saturday. Monica Puig of Puerto Rico reacts after defeating Angelique Kerber of Germany in the women's singles gold medal match at the Rio Summer Olympics. Puerto Rico now has its first Olympic gold medal, courtesy of tennis star Monica Puig, who beat Germany's Angelique Kerber in the women's singles tournament at Rio's Summer Olympics on Saturday. "I"m speechless," a smiling Puig said after her historic win. "I wanted it so bad." "I never imagined in my wildest dreams that this would happen," Puig added — and she said her experience in Rio de Janeiro has been like a dream. She's looking forward, she said, to waking up Sunday morning and seeing her gold medal sitting on her bedside table. As for her plans after the Olympics, Puig said, "I know my life is going to change a bit." But she said some things won't because, she added, "I love what I do." Puig won in front of an enthusiastic crowd at the Olympic Tennis Center, with her more dramatic points leading fans to shout "Si se puede" and wave the flag of Puerto Rico. More than once, the chair umpire went from requesting silence to simply shushing the audience. Puerto Rico has been sending athletes to the Olympics since 1948; before Saturday, Team Puerto Rico had amassed eight Olympic medals — none of them gold. Monica Puig won Puerto Rico's first gold medal, ending a drought that began in 1948. Here, she returns a shot against Angelique Kerber of Germany during their women's singles gold medal match in Rio de Janeiro Saturday. Facing an opponent who hadn't been taken to three sets before Saturday's final, Puig ensured Kerber would have to play three to win by seizing the first set, 6-4. Kerber responded by taking the second, also by 6-4. In the decisive third set, Puig served to open the first game and won a series of quick points. She managed to break Kerber's serve in the next game, with the players trading hits from the baseline. In short order, Puig was up, 3-0. But after the break, Kerber regrouped and seemed poised to hold serve, lashing the court with long, angled shots. But Puig put her on her heels and took the fourth game, as well. She went on to win the fifth, but Kerber held serve to force a seventh game in the last set, at 5-1. The long rallies were likely part of the reason that after the match, Puig said of Kerber, "She's such a great fighter." Puig added that she had to play some inspired tennis to beat her. Perhaps the enormity of the moment finally reached Puig's nerves in that seventh game: Serving, she fell behind love-40 before steeling herself and hitting winners again. But that seventh game was, as they do not say in Brazil, a doozy. Kerber was leading 40-30 and missed a chance to break Puig's serve and make it 5-2, in a point that saw Puig dig out several tough shots as Kerber sought to put the game away. It seemed Kerber would do just that after Puig returned a ball high to the middle of the court, but Kerber's attempt to slam the ball instead zipped it into the net. For minutes afterward, the score flipped from 40-40 to an advantage for one player or the other — but neither could put the game away. Both dumped shots into the net; Puig double-faulted at 40-40 to give Kerber an edge — but she recovered well, and, after slamming powerful forehands across the net, she erased Kerber's advantage with a soft lob that Kerber couldn't reach. Another long exchange followed, as the two players moved each other around the court, and Puig eventually forced Kerber into a bad shot. Celebrating the win, Puig tossed her racket into the air, wearing a look of someone who's found unexpected joy. That final game was the highlight of a match that had several rousing exchanges, with the left-handed Kerber slugging it out from the baseline with the right-handed Puig. Those exchanges whipped the crowd in Rio into a frenzy of applause and appreciation. The crowd included the president of Puerto Rico's Olympic Committee, Sara Rosario Velez. After the match, Velez was surrounded by a happy group that chanted "Puerto Rico! Puerto Rico!" and celebrated with Puig. When we asked Velez for a comment, she said simply, "This is a great day for all the Puerto Ricans — that live in Puerto Rico and around the world!"